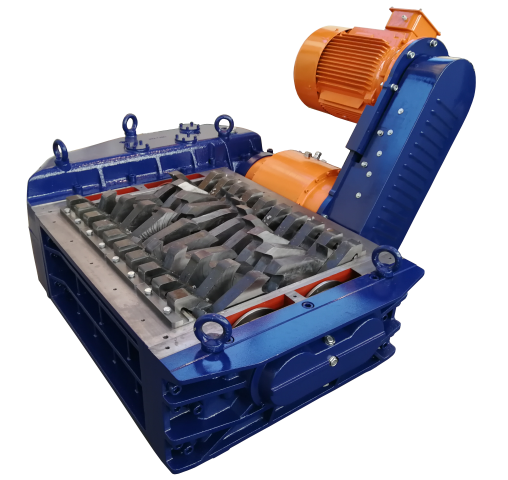 The 2 shaft industrial shredder k50m serie with automatic transmission is derived from the K50 series but has a different type of drive. Unlike the K50 series which has a hydraulic drive, K50M is driven by the innovative M/AWG system. This combines the automatic torque and speed adjustment capability typical of a hydraulic drive but with an electric drive’s advantages. The M/AWG system optimises productivity according to the material to be shredded. Noise emissions are that of an electric machine and are significantly lower than those emitted by hydraulic drive systems. This system allows the drastic reduction of the ordinary maintenance costs (filters and control unit oil) and the significant reduction of any extraordinary maintenance costs (valves, pumps and hydraulic motors). All this allows the shredder to process the same materials as the K50 series with its hydraulic drive, using an electric industrial shredder.